Well, it’s safe to say that the hype and anticipation is over now—it’s officially freezing out there. This week we felt like we could wear boots and beanies, and even scarves, and not look like a complete kook. We then headed out into the arctic weather (okay, slight exaggeration) to visit some of the best Sunshine Coast restaurants that offer a toasty fireplace to warm the toes and drink bottle(s) of red in front of. (Because, what’s a fire without wine? Nutta!) And then we thought, hey—we should share these cosy little spots with you guys! We’re kinda good like that. So here you have it, six of our fave Sunshine Coast restaurants with fireplaces. Head up into the green hills of Montville and you’ll find the air is cooler and the ambience way more… British? Montville Cafe Bar & Grill is truly playing the part with its Tudor, cabin-esque exterior, pretty beer garden, and cosy interior. 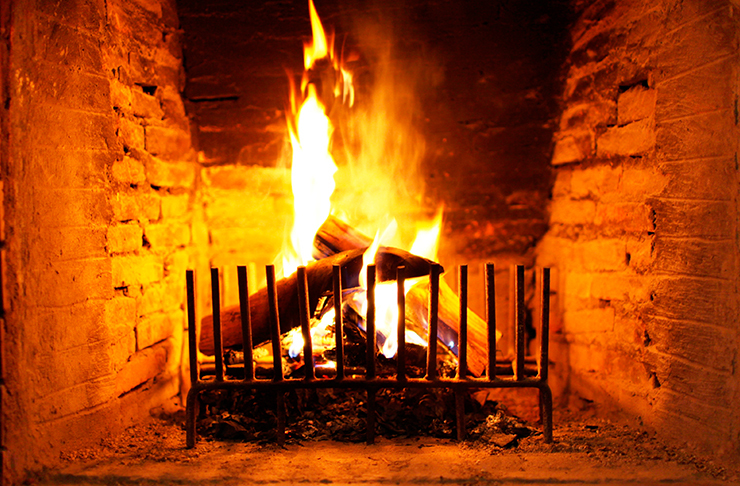 Their log-burning fireplace is surrounded by comfy seats and tables for you to get close and oh-so-toasty. And the menu is busting with delicious comfort food to feast on. Think: slow-braised beef and Guinness pie, golden fish and chips, racks of ribs, cottage pie, and so much more! We won’t be surprised if you go Johnny Depp on us, and smuggle in the pooch to keep your feet extra warm. Winter doesn’t like to discriminate, so it’s happening down on the beach too. Embassy XO has a casual and elegant lounge bar with a welcoming fireplace perfectly situated between the leafy window views and the bar. You can set up camp (warm fire provided!) and easily order a glass of fabulous vino to go with one of their amazing Yum Cha dishes—from right there, without even having to move. Except maybe if you need to go to the loo. Which is a bummer, ‘cause someone is seriously going to steal your spot. It’s not hard to see why we’re rating this Sunshine Beach gem as one of among the best restaurants on the Sunshine Coast with fireplace. If it’s a special occasion, then we highly recommend you get acquainted with Harry’s fireplace. (That sounded way seedier than intended.) Harry’s on Buderim is a relaxed yet fine dining restaurant, set on a 120-year-old homestead surrounded by rainforest. They have an elegant fire room (yes, apparently that’s a thing?) with the kind of beautiful fireplace that you’d totally want to replicate in your #dreamhome. Their menu is an inspired blend of Australian and Asian food, and the tranquil and intimate setting will leave your better half staring lovingly into your eyes. If not, then we suggest you pick up a little book called “He’s just not that into you”. We’re voting this one, The Most Romantic Fireplace on the Sunshine Coast. A micro brewery WITH a fireplace?? Cha-ching! Sign us up baby, we’ve hit the jackpot. And it’s not only craft beers Wild Rocket are making on-site. Beef sausages, breads, stocks, sauces, and even jams and chutneys are all made in-house, from the best local produce and free range organic meats. And did we mention they have a fireplace? Situated in one of the most historic buildings in Montville, this quaint restaurant with its nooks and crannies and open fireplace had our hearts jumping, bellies grumbling, and faces warming in all its glow. If getting heated in a micro brewery doesn’t quite light your fire, then perhaps a different, more wine-induced Montville experience will do the trick? The boutique restaurant at Flame Hill Vineyard serves a delicious, seasonal a-la-carte lunch, where you’ll be nestled among green rolling hills and privy to sea views in the distance. The folk at Flame Hill pride themselves on their kitchen garden and offer a paddock-to-plate experience, with estate-grown wines to match. Could this get any better? Yes, yes it can! While you soak up the joy of it all, you’ll be warmed by the wood-fire burners dotted around the restaurant and offered a little rug to put over your knees—for that extra bit of snuggle. Perhaps the most luxurious choice of fireplaces, no? If it's an epic fireplace you're after there is no need to go anywhere else, cause Spicers Clovelly have you covered. Tucked away in a beautiful estate in the hills of Montville, The Long Apron restaurant is the dining jewel in the crown of luxurious Spicers Clovelly Estate. Open to the general public, The Long Apron is open to all and is ideal for day-trippers and long-weekenders alike who might be looking to keep warm. It's a must see when visiting the beautiful Hinterland. Already bestowed with 2 hats, The Long Apron delivers the goods if you're after locally sourced produce (from surrounding farmers and suppliers in the Sunshine Hinterland no less), and incredibly original, beautifully presented cuisine. Open for breakfast lunch and dinner, The Long Apron is the perfect place for a special occasion, a catch up with friends, or just a little treat. This is one meal you're not going to forget in a hurry! OK so we know you love the cold. What about checking out the best things to do in the Noosa Hinterland here? OR what about checking out the best hot chocolates on the Sunshine Coast here. Or maybe hitting up our guide to the best cafes in the hinterland here.